There is no surprise in the rather depressing statistics contained in today's Sky News poll which reveals that people in Northern Ireland remain more likely to maintain close friendships only with those of the same religion, with young people as divided as their elders. Just over half - 51% - confirm that most or all of their close friends are in the same religious cultural group, while again - unsurprisingly - the figures rise to 62% for DUP voters and 65% for Sinn Fein voters. 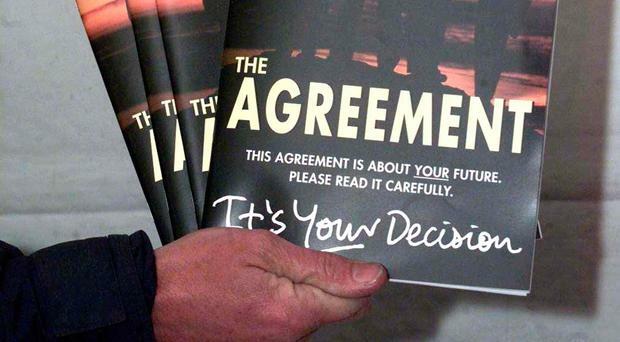 This is sad on the 20th anniversary of the Good Friday Agreement, but that is where we are. It would be inspiring to be able to confirm that we have moved into a new era of integration, but we have not. That kind of enlightened progress takes time and effort, and the evidence all around confirms that we live as two largely separated communities. People may not like to admit this, but in broad terms the unionist and nationalist/republican communities live and operate within their own cultural and social silos. We largely stay among our own people and institutions, ranging from our own schools, medical dispensaries and dental practices, to shops and other mainstays of local existence. Mixed marriages are more common than in the past, but many people still tend to meet, engage and marry within their own cultures. The prevailing sectarian violence and deep hurts from the distant and recent past also reinforce the barriers, which do not appear just by accident. There is a reason for this community apartness. Good leadership is needed to tackle this debilitating social and political reality, but sadly much of the recent political discourse has been harsh and divisive. Despite pioneering and commendable work on integrated schooling, far too many young people do not meet their peers from "the other side" until they join the workforce or experience third level education, and sometimes not even then. Nevertheless, important work is continuing among people of all ages to try to bridge the cultural divides, and when they do meet they often realise that they have much in common. That is the key to moving from the baleful old Orange versus Green stereotypes, and therefore much more needs to be done, through funding and by example to create a truly shared society, and to build a better tomorrow for all.